ESPROS’ first ever TOF Academy held recently proved a resounding success. 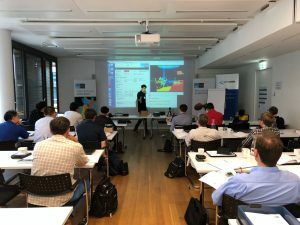 The two-and-a-half day event at Swissmem in Zurich was designed to give a very clear overview of Time of Flight systems and how to make the most of their potential. ESPROS CEO Beat De Coi and his team showed how important it is to have a deep understanding of underlying optical physics, a behavioral model of the imager used, the effects of good or bad lenses etc. and an excellent understanding of the artifacts, in order to create a successful TOF camera design. The course featured a mix of theoretical background as well as guidelines to working implementations based on examples and practical work. A survey following the course gave an overall satisfaction rate of more than 90 percent. Even experienced camera design engineers were able to learn a lot about the differences between 2D and 3D camera design. Participants praised the depth of knowledge and understanding provided, saying it provided the self-confidence needed to deploy the technology. The course itself consists of 10 lessons, supported with more than 300 slides provided in a comprehensive book. It is planned to host further European TOF Academy events, as well as ones in the United States, China and elsewhere in Asia.